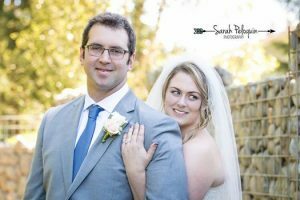 Wonderful couples get married in Seattle, Summer 2017! I just looked at my calendar for the past couple of weeks. And I smile. Am I a lucky gal or what? It’s my privilege to be with a couple when they say ‘I Do.” After all of the years of doing this work, I hold a couple’s trust close to my heart. So, let’s celebrate! 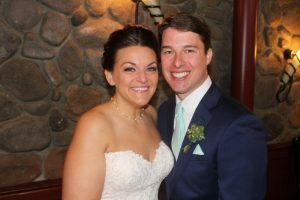 Jesse and Stephanie welcomed family and friends to The Monte Cristo on June 9th. I remember walking into the bride’s room before ceremony and finding Stephanie looking beautiful, serene and happy. There is no better feeling than seeing Stephanie walk down the aisle (lit candles and all!) with grace and the knowing she was making the highest choice for her life. Chris and Amber sparkled up The Canal in Ballard on a June Wednesday evening and despite a bit of chill and rain, we were lucky to have their ceremony outdoors, under a covered area. 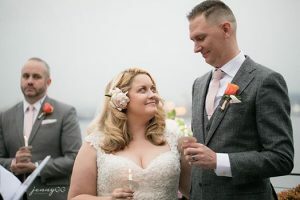 I loved everything about Chris and Amber – mostly, their fun-loving, gracious and easy-going approach to their wedding day and the sweetness and vulnerability of their ceremony and love story. 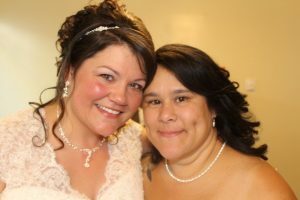 Unlike Chris and Amber’s wedding day, Tamara and Maria were married on June 11th, one very hot Sunday! At a beautiful church in Tacoma, these two loving and inspiring women exchanged vows, in the loving presence of their children and families/friends. If there were ever two women meant to be together, these two could be poster kids! The very wonderful Ann and Jeremy were in Mexico for 2 weeks after hosting a beautiful wedding celebration at their home in downtown Seattle. With their closest people around them, and in the presence of Jeremy’s son who stood as “Best Man,” we had a lovely ceremony complete with laughs, hankie moments, a reverse unity candle ritual and more. 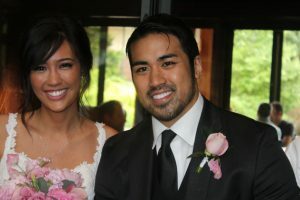 I remember walking into the reception area of The Willows Lodge on June 18th, about 30 minutes before Joseph married the love of his life, to find him rehearsing his special and surprise reception solo song to share with his bride. The tone of this ceremony was semi-traditional, reverent and sweetly shared bits of their love story. Woof! 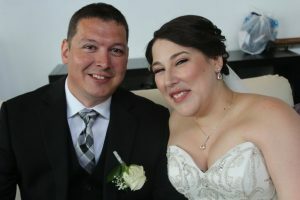 I left John Ryan and Stacey after their wedding ceremony on Friday, June 23rd, at the Red Cedar Farm in Poulsbo, with the biggest smile on my face. After 10 years of loving relationship, these two lovebirds got hitched. Delightfully, they included their two dogs, Penny Lane and Zeke, into their wedding ceremony. I loved looking over and seeing Penny Lane taking a snooze (she’s a basset hound!) and somehow, Zeke got lose during ceremony and he went for a run, with a delightfully well-dressed woman running around him.